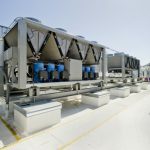 Many large commercial buildings use a circulating water system as part of their Heating, Ventilation, and Air Conditioning (HVAC) systems to condition the environment in the building. The circulating water is heated or cooled and then distributed to water-to-air heat exchangers throughout the building to condition the air in the building for occupant comfort. In the summer, the circulating water is cooled by a device commonly referred to as a chiller. A building may have a single or multiple chiller units which can range in size from a mid-size car to a bus. Chillers utilize a refrigeration cycle to exchange heat between the circulating water and a refrigerant fluid. Heat collected in the refrigerant fluid is exhausted to the outdoor environment. In many applications, the chiller is located on the roof of the building or on the ground next to the building. In these applications, a portion of the circulation water system is plumbed outdoors through the chiller unit, which leaves the chiller susceptible to freeze damage if the unit is not properly winterized in the fall. While it varies by manufacturer and the design of the chiller, the most common method for winterizing a chiller is to isolate it by closing valves within the heated building space, and draining the chiller. Additionally, the water tubing in the chiller consists of a number of turns which impede the complete draining of the unit; therefore, filling the unit with an antifreeze solution is one method to ensure that freeze damage will not occur. In instances where the unit has not been properly winterized, freeze damage typically manifests itself in a rupture of the water tubing in the chiller and the subsequent contamination of the refrigeration fluid by water when the unit thaws. Water within the refrigeration fluid can then damage the refrigeration compressors. While such damage can be repaired, the cost of replacement components, the cost of field labor, and the extensive effort required to dry the refrigeration system can result in the complete replacement of the unit being a more cost effective solution. Building owners commonly discover freeze damage to the chiller in the late spring when they begin recommissioning the chiller for summer operation. If you have an equipment breakdown claim involving a chiller or other HVAC device, we can determine the cause. Michael Brinker, P.E. is a mechanical engineer at ARCCA specializing in the failure modes of HVAC systems and devices and the electrical and mechanical failures of consumer/commercial appliances and products, industrial equipment, construction equipment, boilers, elevators, and fire suppression systems. To view his CV or to contact Michael, click here.